When her beloved high school teacher appears on her doorstep, Deputy Chief Jess Harris is flooded with fond memories-until the woman says she's about to be charged with murder. Called to the scene of the crime, Jess learns the victim of the bizarre and brutal slaying was a member of Birmingham's famed "Five." Twelve years ago, the Five were rich, popular high school seniors who threw one wild last party. Two social outcasts were invited to play in the "loser games." The next morning, one player killed himself. Now Jess fears that an invitation to an upcoming class reunion may have forced the Five to play a new deadly game. As Jess fights to keep her former teacher from suspicion-and her relationship with Chief Dan Burnett separate from her work life-she knows she is caught in a vicious cycle of vengeance. And the killer is far from finished . . Okay, Webb has officially won me over. Unlike the last book, Rage, I went into Revenge knowing there was going to be practically no romance even though it's marketed as a 'romantic suspense' and I think that really helped me love it. The suspense/murder mystery as Jess and her team race to find a killer slowly murdering a group of high school friends was exciting and interesting and kept me glued to the pages as they put it all together. I really like Jess. She's no nonsense, slightly older than your average heroine-- coming in in her early 40s--and she doesn't mess around or play games. If something needs to be done she gets it done. I love watching her mind work things out when she's on the job and seeing her deal with her skittish feelings about her boss Dan. Like I said the romance is so incredibly light it could easily be taken out of the book and not make a difference. But what's there is moving in the right direction and I'm hoping will play a bigger part at some point as she and Dan tow the line of having a private and professional relationship. You don't see too much of Dan but I'm so loving his over protective self. The series is ongoing--each book completely solves a murder mystery but it's the same lead characters throughout-- so I really recommend reading it in order for full impact. Webb's writing flows very smoothly and quickly as the teams works to solve the murders that are piling up. I really enjoyed trying to figure it all out and piece it together and kinda liked that I wasn't able to catch everything or see it all coming. If you like cop murder mysteries this one is definitely one I'd recommend. 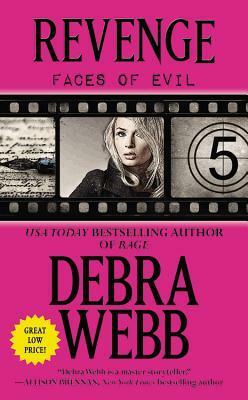 Have you read Debra Webb? What did you think? Do you have a favorite cop mystery/suspense series?